Just the other day local politicians got together to discuss the future of Canadian housing. There was about a one hour segment where politicians grilled CMHC’s Evan Siddall. Most of the focus was on the stress test and further lending policies moving forward. You can watch that full interview here. Since the implementation of the stress test CMHC says there has been a 15-20% reduction of first time buyers being able to qualify for an insured mortgage. CMHC says they are pleased with the results to weed out over leveraged buyers. Of course, this had some local politicians up in arms saying that CMHC is denying first timers the Canadian dream of home ownership. How quickly they forget just how generous the banks have been in recent years. The massive lending towards residential real estate is unprecedented. 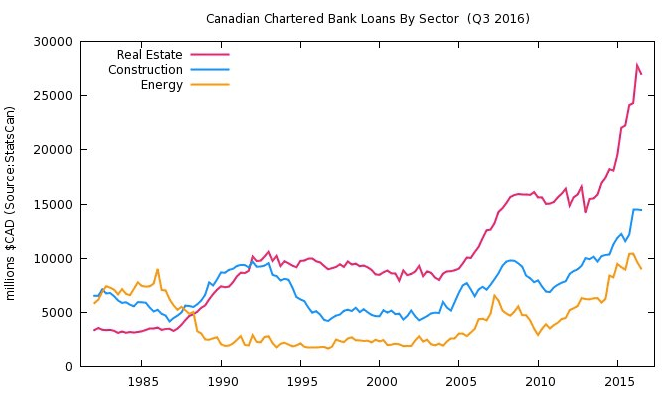 Canadian bank loans by sector. CMHC’s Evan Siddall says the Bank of Canada is continuing their research towards implementing risk sharing with the big banks. They want the banks to pay a deductible should someone default on their payments. CMHC says if this is implemented that borrowers can expect between a 10-50 basis point increase on their mortgage borrowing costs. Perhaps the best part of the entire interview was when politician Ron Liepert ripped CMHC’s Evan Siddall on his implementation of the stress test. Mr. Liepert discredited any arguments surrounding high levels of household debt (which is now worth more than the entire Canadian economy) and suggested there was no concrete evidence it causing an economic slowdown. I found this to be downright worrisome that some of the people running our country really have no clue. As the two famed economists who wrote the book House of Debt, which CMHC references, highlights there is a direct correlation between high levels of household debt and financial crises. The authors of the book studied the past 60 financial crises and found mounting evidence that suggest the bigger the housing boom, generally the bigger the bust. Anyways, there’s a clip of that enlightening conversation midway through my video below.